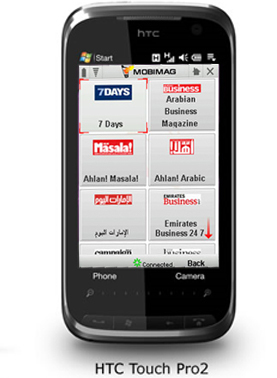 Mobivision the digital development arm of Arabi Holding Group (Kuwait based corporation) have launched a digital magazine reader that runs on (some) smart phones for regional publications today. Mobivision the Dubai based company has taken upon itself to solve one of the region’s biggest publishing problems: Lack of multiple revenue streams. It proposes a solution by providing a platform where all regional publishers can provide their content to their increasingly growing mobile reader base, laced with ads. We tried out the app, and regardless of how sloppy they get the job done, we must conclude they actually do. Their concept is implemented by aggregating content from the regions publishers to mobile phones allowing them to slip in some ads and promotions as they go. The app being free to download from the website, that doesn’t seem so bad. 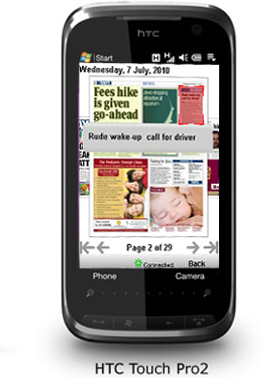 Mobimag creates an interactive mobile experience for readers, which publishers themselves have failed to provide, saving them the time and effort of developing their own dedicated apps. At the same time providing the avid on-the-go reader with all their favorite regional newspapers and magazines in one place. What disappointed us other than the primitive interface, is the fact the app developers have failed to provide any Blackberry, iPhone or Android versions their app, alienating the three fastest growing smartphone markets in the region. So unless you’re using a Windows Mobile or Symbian based smartphone, this app is out of your reach till the end of the year, which is when Mobivision have promised to graciously provide for us. Since I’m using an HTC Desire, I won’t be able to do any heavy duty testing, let us know what you think of the app after you try out too.